Non-crabber moving my crabs; what to look for? 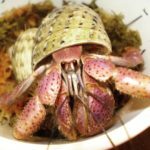 An exotic animal rescuer is going to retrieve my crabs (background: we had to move to another state, no one would move the 90g, so crabs were left in the care of my non-crabber daughter for a while). Rescuer is familiar with snakes and other reptiles, has not rescued crabs. Our three crabs are large/medium, large, and jumbo; we've had them for about 9 years now, many molts. My daughter says at least one has been up recently, but it is unknown whether the other two are possibly down molting (possibly no longer alive--always a possibility ). First, I assume that the safest thing for the crabs is to dig them up and put them in separate containers before moving the tank, because of the danger of tunnels collapsing from the jostling around (not to mention that the tank itself might break somehow in the move (God forbid). Agreed? Second, having never dug up buried crabs (I just let "nature" take its course when they are down), what should I tell him to look for, to know if one is in the midst of molting, and what should he do with a crab that IS molting? I know if he finds bits of exo down there with the crab, that would indicate the crab is molting, and he should put both the crab and the exo in a small container with holes in it for air flow, put that container in proper conditions, and cover it to make sure it is dark while the crab finishes molting and hardening--but how should I tell him to distinguish between a crab that is just underground for the day and a crab that is down molting/finishing a molt, but there's no obvious sign of that (i.e. bits of exo still present)? Resident PP's:"Major Tom" "Billie Jean" & "Mr. Jones"
MT and BJ jumbos now. Everybody excited to move somewhere warm and beachy. Re: Non-crabber moving my crabs; what to look for? Does he have any familiarity with Tarantulas? Not sure; he mentioned snakes and reptiles. I don't know if he's ever cared for any inverts yet. Well, the good news is that they were all moving at least a little when he went to retrieve them, and no sign of exo, so hopefully that means nobody was in the midst of molting, but I guess "it is what it is" at this point. He said the tank was a bit below ideal temp, so we'll have to see how they do after he gets the tank moved and set up again and gets them back to proper temp and humidity.